NEW Disneyland Wall Sign Plaque Vintage Park Entrance Marquee New in box! Follow your heart to The Happiest Place on Earth and bring home this replica sign of Disneyland's classic Main Entrance marquee. Now you can live or work under a positive sign of the times all year'round! Replica of original Main Entrance parking lot marquee at Disneyland Park. Screen art print on composite wood backing. 10 1/2'' H x 36'' W. Lots of my items are brand new, designer items and all come from a smoke-free, pet-free environment. 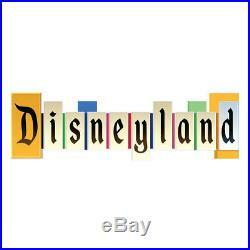 The item "Brand NEW Disneyland Wall Sign Plaque Vintage Park Entrance Marquee NWT NIB" is in sale since Tuesday, May 22, 2018. This item is in the category "Collectibles\Disneyana\Contemporary (1968-Now)\Theme Park Souvenirs".